These are the reviews for Salem. There are 42 reviews. 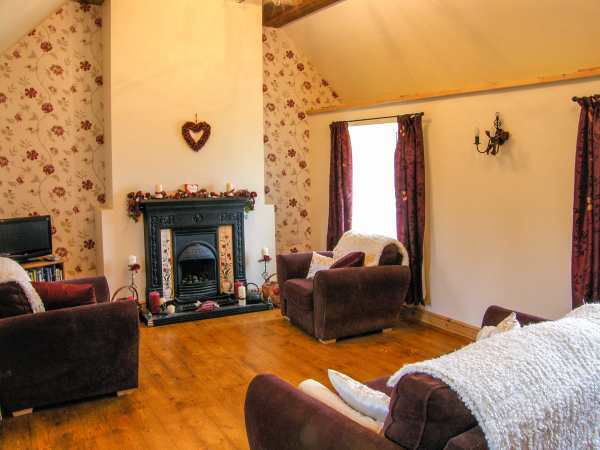 Lovely cottage - warm, cosy and extremely well equipped. Great location for walking, together with stopping off at welcoming country pubs for a drink and a bite to eat. Superbly quiet at night. This, coupled with the fact that there was no street lighting, gave us the best 7 nights' sleep we've ever had! We thoroughly enjoyed our week in Anglesey. I did not hear from Sykes cottages or see anything in the cottage relating to Sykes cottages. However, I did speak with the owner who had left us a lovely welcome basket along with a welcome note. She was extremely helpful and welcoming. The cottage had everything you needed. The description given, doesn't put across just how lovely it is. Totally relaxing. I would definitely recommend to anyone to visit Salem. An excellent stay in a beautiful cottage. Wonderful location, happy memories. Very unique cottage, comfortable and extremely quiet. Well worth the long rough driveway. Stunning coastal walks and walks from cottage. Loved it. Salem is a beautiful cottage in stunning setting. It has an enclosed garden which is children friendly. In a fantastic location with lovely views, the parking was good and there was a relaxed feel to the place. It was near to a lovely beach at Benllech, and had a great sized bathroom with bath and separate shower, had a lovely garden with views, walking from cottage if you need it and it was close to a shop and a few pubs. If I went back to Anglesey in the future I would want to stay there again. Salem is a charming, homely cottage of quality with thoughtful touches to delight in every room. Everything here functions effortlessly from the fully equipped kitchen, efficient radiators to the cosy gas fire in the vaulted lounge. Local materials are found throughout with solid wood and slate floors adding to the sense of quality and Angelsey heritage. All the comforts of a modern home in a quiet, private setting located conveniently close to several coastal villages with expansive views towards the sea from the attractive garden. The owner was helpful and welcoming, offering any assistance while keeping discreet to allow our peace and privacy. Definitely, a cottage and area I relish returning to one day. We loved the cottage. It's set in a beautiful location and the owner has really thought about all the little touches. The welcome pack of wine and goodies was very much appreciated and a lovely touch. Parking is great with lots of room. The road to the cottage is unpaved and bumpy so if you drive a low slung car be aware. We were blown away from the minute we arrived. The entrance hall is warm and welcoming. The kitchen was perfectly set out and great for a family to sit and enjoy a meal at the table with plenty of space. Plenty of cutlery, plates and all the things needed for a family of four. There is a separate pantry for all your provisions which is big enough to store a bike or two (clean the tyres) if you like to ride. Iron, ironing board, hoover, washing machine all in the property. The living area was lovely and very comfortable. High vaulted church style ceilings and nintendo for the kids as well as free view , and dvd player. Good selection of books if you like to read. Board games on hand for the family as well as brochures of surrounding attractions. There is an old church style electric organ in the living room which is fun to play! Bathroom is lovely. The bath is awesome to lie and soak whilst looking out the window into the garden and beyond. Its vey private so son't worry about anyone seeing your wobbly bits. The downstairs bedroom was lovely. The bed is so comfortable and the sheets etc make its a pleasure to go to sleep. Upstairs bedroom has a double bed and a sofa bed. It has lovely views with large velux windows that allow you to stick your head out and enjoy the atmosphere. The garden is lovely and has spectacular views of the night sky and surrounding countryside/ sea view . In the field at the back are a selection of livestock. A few sheep, two pigs, chickens and ponies. Also for the children the icing on the cake was a lovely peahen that enjoys being fed. She liked to sleep outside the patio window of the downstairs bedroom. She is very friendly and loves snacks and will feed from your hand. She does poo on the doorstep though so be careful walking outside barefoot in the morning ;). Finally the owner was very helpful and guided us in via text message. Impossible to get lost following her directions. Don't think about it, just book. You won't be disappointed. An excellent property, highly recommended. The pictures on the website do not do the property justice. It is very spacious and to a good standard. Tucked away along a very quiet track with good country views from the rear garden. There was good food at the pub in Molefre, but the cottage is very well equipped should you wish to eat in. A beautiful cottage which was very well kept. In an idyllic location overlooking the hills and plains of the area. Beautiful cottage decorated in a very quaint and unique style which we loved. Very clean and everything we needed was provided. Our toddler loved the cottage and its beautiful surroundings especially the abundance of wildlife! This cottage is much nicer than the photo's. We would definitely stay here again - loved it! We have just come back from a week's stay at this cottage. My advice to anyone thinking of booking is definitely go for it. The photos of the cottage do not do it justice. I was absolutely blown away when we arrived as to how beautiful it was. The cottage is beautifully decorated and kept, and a lot of care and attention has been given to the finishing touches. There was a nice bottle of wine and hamper on arrival which was a lovely surprise. We have stayed in places before and so we normally take a lot of our own kitchen utensils. However there was no need for us to do this here as it had everything we could have possibly needed! The garden was beautiful and you could watch the sunset in the evening. The only negative to our holiday was the good old British weather - apart from that there is nothing bad I can say about this, and I would definitely recommend staying here to anyone. Anglesey is such a beautiful place and we will definitely be going back. The cottage was beautiful, the pictures didn't do it justice. Had a lovely stay, would recommend this cottage. The owners are lovely and welcoming too. Had a great time, thank you. A beautiful cottage, hidden off the beaten tracks, perfect for a holiday away from it all! Marvellous location, so quiet and unspoilt, no noise at all. A generously proportioned house with nice touches all over it. A rabbit and a peahen wandered around outside. Great views. The owner was unobtrusive but extremely generous and attentive when required. Anglesey is perfect for those who want to get away from the hurly-burly of modern life. Particularly liked the quiet and privacy of the location of Salem, and the abundance of wildlife. We had never visited Anglesey before, and this property was the perfect base to see all areas of the isle. It has excellent décor, furnishings and cleanliness, combined with a brilliant view. It is also in an exceptionally quiet location. Top marks. A wonderful cottage in a stunning location. We couldn't have asked for a more special Christmas stay and the cottage was decorated beautifully for the holiday. The cottage is in a superb location and after being given directions by the owner, it was very easy to find. The cottage was excellent in decor and in comfort and the owner had gone to every length to ensure a comfortable stay and a warm welcome. The welcome hamper of tea making facilities was a lovely thought and there was even a bottle of wine and fresh flowers for our arrival. There were clear instructions on how to work the oven and the gas fire and it was definitely the nicest place that myself and my partner have stayed in. We will definitely be coming back and wouldn't consider staying anywhere other than Salem. Overall the Cottage was great and we would recommend it to a friend. Any criticisms here are only small and intended to give helpful advice to anyone thinking of staying in the future. See the first review for directions, it's not the same as stated in the booking confirmation email. We found it first time without getting lost but that was only because I had a good look at an Ordnance Survey Map beforehand. I can see that it may be difficult to find. When you turn off the tarmac road and onto the dirt track it's a third of a mile up to the cottage. The cottage does not have a name plaque so we were a little hesitant on arrival about which cottage it was. We had booked a supermarket to deliver our shopping and because the cottage was not displaying a name we as we got confused over which cottage it was. Have a good look at the photos before you go and you’ll spot it. had to wait outside during the delivery slot so that the driver could find us. On arrival there was a selection of hot drinks, milk and wine. There was cooking oil, salt and pepper. There was no soap and only one spare toilet roll. Fresh flowers in the house was a lovely touch. We brought lots of new DVDs to watch on the holiday but on arrival realised that there was no DVD player. Consequently we were forced to play cards together as a family! There is a good TV and a couple of radios. There is also wifi but it was a bit intermittent on a couple of occasions, probably due to the mountain top location. It's quiet with no traffic noise and the views are fantastic. Every night we were able to watch beautiful sunsets from the garden and the comfort of the cottage. The owner was helpful. There was an item we needed that was not in the cottage. When we rang the owner she was happy for us to buy one, keep the receipt and be reimbursed. Lligwy beach is the nearest beach and is worth a visit. There is a beach hut there that sells beach games, simple food and hot drinks. We stayed with a little five month old baby. The baby travel cot provided was fine. Bedding for the cot was not provided so remember to bring what you need. Also the outside bins were kept a third of a mile away from the cottage so we had to remember to take the dirty nappies down every day. There is no information about recycling. There are three big steps down to the cottage so be careful if you come with toddlers or anyone with slight mobility problems. The cottage is next to a public footpath which goes to the top of the mountain to a trig point. The view from the top is wonderful and worth the short 15 min walk. There is a friendly peahen that sits at the back door. If you’re taking children to the cottage you may want to take blackout blinds (travel ones) as the blinds over the skylights in the upstairs bedroom let through a lot of light. Only a problem in the summer. Cottage was well positioned to be able to explore the island. A Lovely retreat at the end of a busy day. The island is very laid back and relaxed and a wonderful place to unwind. Cottage was clean and cosy and had a lovely homely feel about it. This is my second visit and would definitely go again. Beautiful cottage, very well kept, lovely views and in a perfect secluded position. Would recommend to anyone! A fabulous cottage tucked away down a quiet track. Short drive to everything with some spectacular views along the way. A friendly peacock to greet you every morning at the back door. A beautiful cottage with everything you need. Lovely beaches to walk along, friendly people, just lovely really. Will be coming back again. It's a perfect getaway cottage. Surrounded by pure nature, a top of the hill cottage where a peacock walks around in your garden, everything kept clean, tidy and lovable, five minutes drive to the beach, 15 mins drive to Tesco. Ponies and sheep grazing day long happily just adjacent to the garden, beautiful sunset experience right from the garden! Couldn't have asked for more. 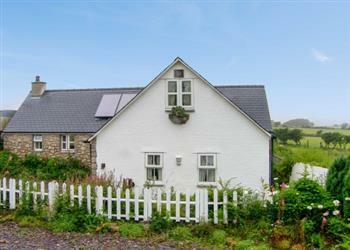 The beautiful cottage was well presented in a remote fantastic location! The surrounding area is gorgeous and the costal walks are amazing! The cottage was excellent, very secluded and peaceful, but relatively easily accessible too. A perfect location for all the things we did. The living room was beautiful, with a lovely fire to warm us up after long cold days exploring. Very cosy and enjoyable. One of the best cottages we've ever had; just so relaxing. Will be returning. The peacock at the door every morning was just great! We liked the fact that we were remote enough for peace and quiet, and yet a short drive to amenities/beach. We liked all the décor, and the way the cottage was laid out. We enjoyed our stay, and we did not have any dislikes about the holiday. Very spacious! The cottage had everything we needed, was clean and peaceful. Directions provided were not correct, it's the third left after the roundabout (not the second) and the distances are well out. Use a satnav to be sure. I saw a friendly ghost in the down stairs bedroom! Salem was conveniently situated for the type of holiday we had planned, walking the Anglesey Coast Path. It was good to come back in the evening to a quiet spot. Great cottage. Great location for a very quiet holiday. The cottage was very nice indeed. Remote enough to be peaceful but close enough to shops and attractions. This was the first time we've booked a holiday cottage and would certainly do it again if this is the standard to be expected. The cottage met with all our expectations, and in some ways the brochure didn't do it justice. It was very well presented and had quite a few nice homely touches, very clean and comfortable. We loved everything about North Wales, and Salem cottage was exactly what we were looking for. Perfect if you are looking for a picture perfect cottage with plenty of chintz, with lots of wonderful hiking and historical sites on your doorstep. Immaculate cottage with everything you would need. Relaxing and cosy. Remote enough to forget about the world but close enough to local villages if we needed things. Everything we needed for a chilled week away from it all. If you're looking for other cottages around Salem, we've got some cottages below which may take your liking. There are 89 cottages within 5 miles of Salem - and they have reviews too.